Chart No. 20 - A Stomach Release and Abdominal Contacts for the Stimulation of the Lacteals and Stagnant Energies. Fig. 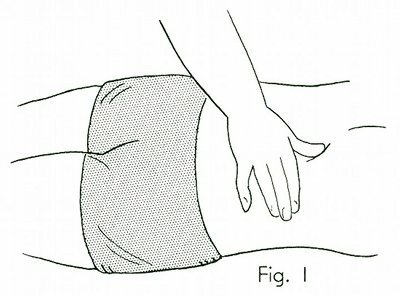 1 shows the patient on the back and the hand of the operator makes mild directional contact under the pylorus with the head lift to release stagnation by emptying the stomach. Fig. 2 shows a free hand contact over tender areas on the abdomen with a partial twist and a firm grip on the tissues with the direction upward toward the opposite shoulder. 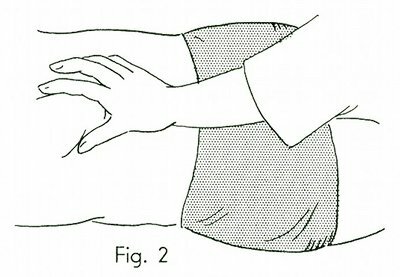 The hand opens and closes repeatedly for a gentle stimulation to the muscles and fatty tissues. Fig. 3 gives a double hand contact with a firm twist of the loose fatty tissue for stimulating the lacteals and producing better drainage. It is a digestive and bowel stimulation by directional energy against the electro magnetic [electromagnetic] flow.